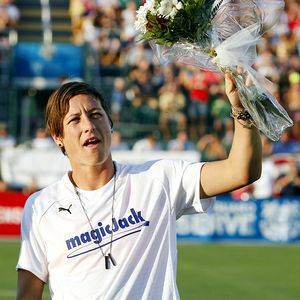 'Abby Wambach Day' in Rochester, N.Y.
ROCHESTER, N.Y. -- The stadium was packed, the "Abby! Abby! Abby!" chanting fans were loud, and Abby Wambach felt everyone required an explanation because many had, after all, come to see her on Wednesday. So at halftime of the Women's Professional Soccer league game between Wambach's magicJack and the Western New York Flash, the U.S. National team star took a microphone and headed to midfield to provide an apology as to why she -- the star of the day -- wasn't playing. "I hope I didn't disappoint too many people tonight, but my body really needed a rest," Wambach said. "Honestly, I'm humbled." AP Photo/David Duprey Abby Wambach, a star at the Women's World Cup, thanks fans in a ceremony Wednesday before her magicJack club played the Western New York Flash in her hometown of Rochester, N.Y.
Wambach didn't play in what was supposed to be her first game back -- and in her native Rochester, no less -- three days after the U.S. lost the World Cup final to Japan in penalty kicks. And her presence even in a limited role -- sitting on the bench, waving to the crowd and signing autographs -- seemed enough for the WPS record-setting crowd of 15,404 on hand. "Abby, you're the best!" yelled one person in the mob of fans that lined the exit waiting for a chance to see Wambach following the Flash's 3-1 win. From Germany to Letterman and finally Rochester, Wambach discovered amid a throng of people that there might in fact be rest for the weary. "I've lived interesting moments in the last 72 hours, planes, trains and automobiles, not much sleep," she said. "Today was fantastic. Honestly, I'm at a loss for words. This is amazing." Wambach didn't play because of tendinitis in her right Achilles, which she said was worse than she had let on in Germany. Weariness also played a factor. She's spent three days of non-stop travel, during which she conducted, by her count, some 500 interviews. That included a stint on "Late Show with David Letterman" on Tuesday night. And if it wasn't for the opportunity to enjoy a homecoming in Rochester -- where the 31-year-old has always been known and celebrated as "Abby" -- Wambach would've preferred curling up in the nearest bed for one long much-needed nap. "We had a long road in Germany, and I have to take care of my body," she said, rubbing her eyes. "In the end, I'm here. That's saying a lot because this city means so much to me." Wambach -- along with goalie Hope Solo -- might have been the face of the U.S. team during the three-week long tournament in captivating the nation back home with her gritty head-first lunging style and clutch goal-scoring ability. Earlier in the afternoon, more than 1,500 screaming fans packed a mall food court in suburban Rochester for a rally. And it was at around 2:30 p.m. -- five hours before game time -- when fans braved the plus-90-degree temperatures and began lining up at the gates at Sahlen's Stadium. One of the draws, aside from seeing Wambach in person, was the chance to be among the first 1,000 through the gates to receive a Wambach bobblehead doll. "We had to choose between going to Eastview Mall, or coming for the bobblehead, and we wanted the bobblehead," said Nancy Brown, who was among the first at the stadium gate along with her daughter Emily and son Colby. "This is very exciting," 11-year-old Emily Brown said, noting that she's had a Wambach poster on her wall since she was seven. "She's in my opinion the best soccer player in the world." Anticipating a large turnout, stadium officials added five temporary metal bleachers across the south end zone, adding about 1,500 more seats, to up the capacity to about 15,000. The announced attendance surpassed the WPS record of 14,832, set in the first game ever in 2009 at Los Angeles. Other U.S. team stars on hand were magicJack's Megan Rapinoe and Flash's Alex Morgan. Flash coach Aaran Lines couldn't help but get caught up in the excitement -- even if it was for an opposing player. "It's absolutely deserved," Lines said, of the attention being paid to Wambach. "All the excitement of the women's game is just massive," Lines added. "This is massive for WPS. It's taken WPS to a whole new level." Vendors sold Wambach T-shirts, with "I Love Abby" printed on the front. The "Love" part was in the shape of a heart with soccer ball lines printed through it. Wearing her No. 20 jersey, Wambach received loudest cheers -- and a 40-second standing ovation -- as all players who competed in the World Cup were presented with flowers prior to the game. More cheers followed a few minutes later when Rochester Mayor Thomas Richards proclaimed this "Abby Wambach Day," and presented her with the key to the city. "Hilarious," Wambach said. "It's been almost a dream. Without the win, of course."